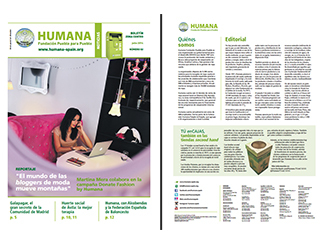 This week begins the distribution of 'Humana Madrid-Centro News' newsletter which includes news, experiences and testimonies about Humana work in Madrid. Environment, development cooperation, sustainable fashion, agriculture and social welfare activities are the main issues of this publication. In total we have published 25,000 copies were distributed mainly through the network of second hand shops and our partners. * 'Solidarity doesn’t stop despite of crisis': Parroquia de Nuestra Señor de la Paz, in Madrid, one of the most important partners of Humana in town. * Interview with Angel Camacho, Councillor for the Environment of the City of Galapagar municipality in which Humana collected in 2013 a total of 66 tonnes of used textiles. 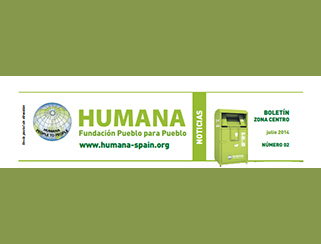 * Humana and Alcobendas: united cooperation through Alcobendas Foundation. * Interview with Martina Mera, Donate Fashion blogger. * Inclusive Education and the Global Action Week.